National Service Scheme was launched on 24th September 1969, 48 years ago. here 1969 year is Gandhiji’s centenary year. 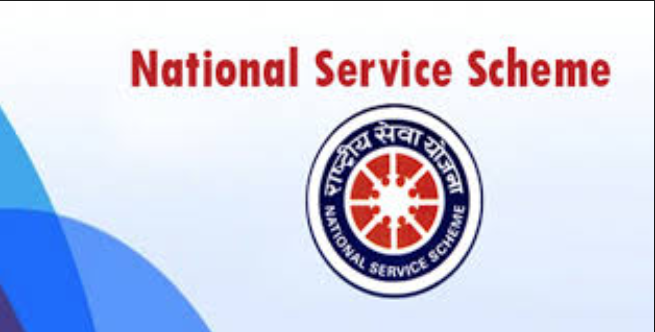 National Service Scheme was sponsored by Indian Government. it is an public service program that was conducted by the ministry of youth affairs and sports of the government of India. Through community service, to developing student’s personality. in colleges and universities NSS is voluntary association of young people. in academic institutions S. Radhakrishnan, recommended the introduction of voluntary national service. in January, 1950 this idea was again considered by the Central Advisory Board of Education (CABE) at its meeting. the board recommended that students and teachers should devote time to voluntary manual work after examining the idea and the experiences of other countries in this field. In 1952, first five year plan adopted by the Government. by Indian students for one year was stressed the need for social and labour service. in 1958, the Chief Minister Jawaharlal Nehru considered the idea of social service as a prerequisite for graduation. Jawaharlal Nehru directed the Ministry of Education. that for to Education to formulate a suitable scheme for the introduction of national service into academic institutions. NSS be a pilot project in select institutions and universities. rupees 5 crores to the NSS during the Fourth Five year plan. Navy Blue – it indicates the cosmos of which the NSS is tiny part, ready to contribute its share for the welfare of the mankind. For social transformation and uplift It stands for continuity as well as change and implies the continuous striving of NSS. NSS program aims to inculcate social welfare in students. NSS provide service to society without bias. volunteers learn from people in villages how to lead a good life despite a scarcity of resources, SS volunteers work to ensure that everyone who is needy gets help to enhance their standard of living and lead a life of dignity. National Service Scheme is “Not Me But You”. In relation to understand themselves to their community. NSS is to identify the problems of the community and problem involved to problem solving process. In a sense of social and civic responsibilities to develop themselves. Finding practical solution to particular or individual and community to utilise their knowledge. Group-living and sharing of responsibilities to develop competence required for it. In mobilising community participation, NSS to gain skills. NSS to acquire leadership qualities and democratic attitude. NSS is to develop capacity to meet emergencies and natural disasters. Social Problems, Education and Cleanliness. Arrange health camp and inviting a doctor for health camp. Here no predefined tasks. volunteers to provide service in any way that is feasible. Short and Large period camp was conducted by NSS. Some program was developed for national welfare like Bharat Scouts and Guides and National Cadet Crops (NCC) etc,. Volunteers are regularly Participates in some program are Blood donation, traffic control, queues in temples, preventing stampedes at functions and national conference to conduct white-paper and project presentations regularly. Voluntary based scheme is NSS. it was starts from standard 11th. The NSS volunteers will be enrolled from the first and second year degree-class students at college level. The students who are from Foreign but studying in Indian universities can join NSS. they may share the experiences of national reconstruction and community work. NCC cadets are not allowed in NSS, similarly NSS volunteer are not allowed in NCC or not any other. in two years duration NSS volunteer needs to devote a total of 240 hours social service. NSS volunteer has to devote 20 hrs of orientation and 100 hrs. of community service in every year. In NSS you can be enter without any type of cost. for Be NSS volunteer, you have to contact the NSS Program officer of your school/ college. NSS Enrolment are successfully completed. After the successful completion of required hours for NSS then issued a certificate. during admissions NSS volunteers can get some weight-age in higher studies and other benefits as decided by the institutions/university. In NSS college/+2 level is the grass-root unit. According to the strength of students an institution will be allotted NSS units. In consultation the number of units will be allotted by the Programme Coordinator with NSS regional directorate and state NSS officer considering the demands of the institutions. Normally, in unit the strength of volunteer is 100. NSS unit in-charge is a Programme Officer. For appointment as Programme Officer those are belonging to the teaching faculty and considered for program officer. under the supervision and direction of Principal of the college or head of the institution program officer is responsible for the organisation of NSS unit. In every university, NSS are there to supervise and coordinate NSS Programme in Colleges affiliated to it. In Universities, NSS volunteers strength is more than 10000 volunteer have full time program coordinators. In Universities, NSS volunteers strength is less than 10000 volunteer have part time program coordinators. A State NSS Cell headed by the State Liaison Officer (SLO) coordinates the programme at the State level. For establishing the State NSS Cell the Government of India extends cent percent financial assistance. In the country NSS Regional Centes have been established to maintain liaison with the State Governments Universities, +2 Councils and TOC/TORCs for the effective implementation of NSS Program. NSS Regional Centre is a subordinate field office of the Ministry of Youth Affairs & Sports which is established depending upon the volunteers strength and size of the state. it was headed by a Deputy Programme Adviser or an Assistant Programme Adviser. The Deputy Programme Adviser belong to Group-A grade of the Central Government Service.